It's time for Friday's Hunt again! Today we're getting close to the end of the alphabet. Our prompts from Eden Hills are: Starts with W, Week's Favourite, and Pastel. The weather has not been all that good this spring. We started with a very late spring, and then it got very, very wet. It seems to be raining all the time over the past few weeks, far more than usual. Today is no exception. It's been bucketing down, on and off, all day. The rain has made a lot of areas of standing water in the woods and that has resulted in a bumper crop of mosquitoes. We also had a recent episode of hail. Here you can see the hail bouncing off the roof of my car. I would really like it to warm up a bit, and dry out a bit, too! Little Épinette Nutkin was sunning herself on the windowsill this week. She looked so comfortable and content - I had to take her picture. I think she is my week's favourite! 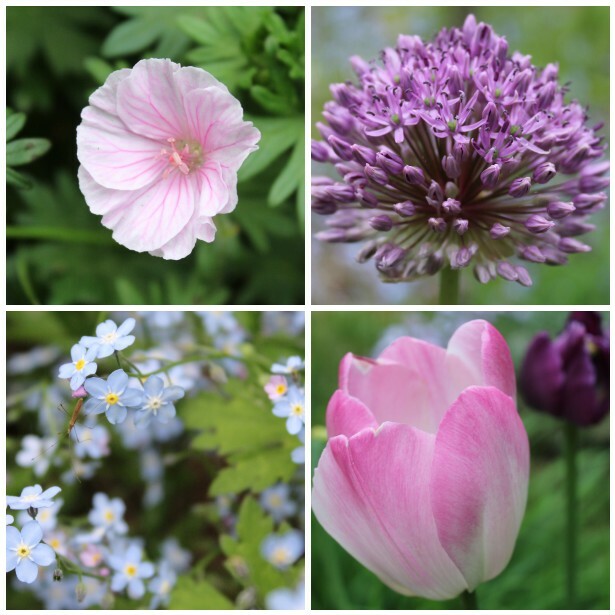 There are many pastel shades in my garden right now - the tulips are continuing to put on a good show, and the forget-me-not is blooming like crazy. There are also some pale lilac coloured allium blossoms. One of the cranesbill geraniums has also started to bloom with pastel pink flowers. Here are some blossom pictures. Another type of pastel is the oil pastel. I have a set of oil pastels and a matching sketchbook that I bought several years ago, but which I haven't yet used. I would like to try them out soon. I was attracted to the cute image on the package and the sketchbook, because I do have a fondness for hedgehogs. Oil pastels are made with pigment and a non-drying oil, with a wax binder. The colours are simply delightful and I think I would have fun playing with this set. I just need to find the time! So many things I'd like to do, but work comes first. Of course Nutkin is my favorite. He has a nice place to relax. We've had either rain or gorgeous weather, mostly a nice spring. I wanted our t also but I had mre than would want to see already. You have beautiful flowers. I especially love the tulips and forget-me-nots. It has been rather dreary here over the past week, too. We had an early start on spring, though. Our wildflowers were blooming by Valentine's Day! I guess they didn't want to miss the 6 tornadoes that were in the area that day. Mosquitoes...OY! There are zillions of them here! Did the hail mess up your car? I sure hope not. ...your "W"eather is much like ours. Pretty pastels. Prayer from "W"armer "W"eather. Great post for Fri Hunt. Even in California it was a slow start up for spring. Even how there are still days we have 50 degree weather(of course it's a 10 degree cooler in the mountains). Looks like a nice set of oil pastel. I use soft pastel (there's no oil in it - it looks like chalk, but this is the kind Rembrandt, Degas and historic painters used). I'll give you a look from my other page "Artnotes." This is the post with some of my pastel paintings. https://artnotes2016.wordpress.com/2016/08/08/soft-pastel-nature-and-landscapes/ Enjoy and have a great weekend! And here where usually it rains all the time (Belgium) we have warm and sunny weather and it doesn't rain enough for the farmers ! I don't do oil pastel but the soft pastel, I love to do that or paint with acrylic ! Sorry to hear about the miserable weather. We are crazy dry and hot for this time of year. The bunny does look quite content to be stretched out in the window. Very cute. Love the blooms. I know what you mean about so many things to try and do if only there were time. Thanks so much for joining Friday's Hunt. Have a great rest of the week!